We are kicking off the 2010 Challenge Series with the Year of the Tiger which just so happens to coincide with Valentine's Day in the West. The Tiger is the third sign in the Chinese Zodiac cycle, and it is a sign of fearlessness. It is considered incredibly brave, evidenced by its willingness to engage in battle. So whether it's your love of Tigers or love of primes, please come join us in an East & West fearless attack on Proth Primes. A 3 day Challenge is being offered on PrimeGrid's Proth Prime Search (LLR) application. NOTE: Only PPS work will be released during the Challenge. However, PPSE resends will occur. All completed work, PPS or PPSE, will be credited in the Challenge score. To participate in the Challenge, please select only the Proth Prime Search (LLR) project in your PrimeGrid preferences section. The challenge will begin 14 February 2010 18:00 UTC and end 17 February 2010 18:00 UTC. Application builds are available for Linux 32 bit, Windows 32 bit and MacIntel. These applications will be sent to 64 bit clients. As with all LLR application projects, there is no advantage of 64 bit over 32 bit. NOTE: The countdown clock on the front page uses the host computer time. Therefore, if your computer time is off, so will the countdown clock. For precise timing, use the UTC Time in the data section to the left of the countdown clock. Scores will be kept for individuals and teams. Only work units issued AFTER 14 February 2010 18:00 UTC and received BEFORE 17 February 2010 18:00 UTC will be considered for credit. We will use the "prime score" method which is based on the n value (k*b^n-1) to score the challenge. The only difference is that the primary and double checker of a WU will receive the same score. Therefore, each completed WU will earn a unique score based on its n value. The higher the n, the higher the score. This is different than BOINC cobblestones! A quorum of 2 is NOT needed to award Challenge score - i.e. no double checker. Therefore, each returned result will earn a Challenge score. Please note that if the result is eventually declared invalid, the score will be removed. For details on how the score is calculated, please see this thread. We kindly ask users "moving on" to ABORT their WU's instead of DETACHING, RESETTING, or PAUSING. ABORTING WU's allows them to be recycled immediately; thus a much faster "clean up" to the end of an LLR Challenge. DETACHING, RESETTING, and PAUSING WU's causes them to remain in limbo until they EXPIRE. Therefore, we must wait until WU's expire to send them out to be completed. The Proth Prime Search is done in collaboration with the Proth Search project. This search looks for primes in the form of k*2^n+1. With the condition 2^n > k, these are often called Proth primes. This project also has the added bonus of possibly finding factors of "classical" Fermat numbers or Generalized Fermat numbers. As this requires PrimeFormGW (PFGW) (a primality-testing program), once PrimeGrid finds a prime, it is then tested on PrimeGrid's servers for divisibility. Our initial goal was to double check all previous work up to n=500K for odd k<1200 and to fill in any gaps that were missed. We have accomplished that now and have increased it to n=800K. PG LLRNet searched up to n=200,000 and found several missed primes in previously searched ranges. Although primes that small did not make it into the Top 5000 Primes database, the work was still important as it may have led to new factors for "classical" Fermat numbers or Generalized Fermat numbers. While there are many GFN factors, currently there are only about 275 "classical" Fermat number factors known. Current primes found in PPS definitely make it into the Top 5000 Primes database. Once the 800K goal is reached, we may head to 1M before turning our focus to smaller k values and higher n values. For example, k<300 complete to n=2M, k<600 complete to n=1.5M and so on. The Proth Search project was established in 1998 by Ray Ballinger and Wilfrid Keller to coordinate a distributed effort to find Proth primes (primes of the form k*2^n+1) for k < 300. Ray was interested in finding primes while Wilfrid was interested in finding divisors of Fermat number. Since that time it has expanded to include k < 1200. Mark Rodenkirch (aka rogue) has been helping Ray keep the website up to date for the past few years. Early in 2008, PrimeGrid and Proth Search teamed up to provide a software managed distributed effort to the search. Although it might appear that PrimeGrid is duplicating some of the Proth Search effort by re-doing some ranges, few ranges on Proth Search were ever double-checked. This has resulted in PrimeGrid finding primes that were missed by previous searchers. By the end of 2008, all new primes found by PrimeGrid were eligible for inclusion in Chris Caldwell's Prime Pages Top 5000. Sometime in 2009, over 90% of the tests handed out by PrimeGrid were numbers that have never been tested. For 2010, we hope to complete our reservation to 800K and extend it to 1M. PrimeGrid intends to continue the search indefinitely for Proth primes. (Edouard Lucas: 1842-1891, Derrick H. Lehmer: 1905-1991, Hans Riesel: born 1929). The success of last year's Winter Solstice Challenge was incredible. It was by far the most active and productive Challenge in the two years of the series. A large part of that was because of the introduction of the CUDA application...compliments of Bryan Little (mfl0p) and Gerrit Slomma (roadrunner_gs). Also, the improvements to the AP26 CPU application allowed for credit to be at a premium (although we lowered it marginally). The Challenge saw many new users and more activity in teams already participating. To those, this next Challenge may come as a shock. There are no GPU applications available. Additionally, there is no advantage of 64 bit over 32 bit. LLR is strictly a 32 bit CPU application (although it's sent to 64 bit machines). It has not benefited from the numerous optimizations that the sieves and AP26 applications have. Primality proving is a much different beast and optimization is hard to come by. However, with that said, if there are any adventurous users who wish to investigate optimizing LLR, the source can found here. Additionally, there is a known LLR slowdown across multiple cores. This has stumped a lot of people. At this time, no one has been able to identify the exact reason. If you wish to participate in helping to identify the cause please see this thread: LLR slowdown across multiple cores. This year's Challenge Series is a sampling of 9 different projects with a nice mixture of LLR and AP26/sieve. We consider this year's series the most challenging yet because users and teams will need to come up with different strategies to optimize their chances at winning...or at placing in the points (an LLR challenge vs. a sieve challenge vs. the AP26 challenge). Each one will have different strengths and weaknesses. We look forward to the Challenges and to hopefully finding several major primes this year. We wish everyone the Best of Luck. To participate in the Challenge, please select only the Proth Prime Search (LLR) project in your PrimeGrid preferences section. The challenge will begin 14 February 2010 18:00 UTC and end 17 February 2010 18:00 UTC. Only work units issued AFTER 14 February 2001 18:00 UTC and received BEFORE 17 February 2001 18:00 UTC will be considered for credit. NOTE: Only PPS work will be released during the Challenge. However, PPSE resends will occur. All completed work, PPS or PPSE, will be credited in the Challenge score. Stats will be available on the front page next to the timer within 30 minutes after the start. The server always gets hit hard at the beginning of the Challenge. However, we will be using the same procedure that we used last year for all the Challenges which proved very successful. A few hours before the start (14 February 2010 18:00 UTC) "max cache" will be dropped to 16 tasks per core. Additionally, "max to send" will be dropped to 8 tasks per core. Anyone attempting to request more will be met with "max cache" messages. We'll raise the buffer to at least 10K. At the start of the Challenge, these settings will be adjusted as necessary. However, if the past year is any indication, we'll make the first adjustment around 30 minutes post start by raising "max cache" to 32. We'll continue to increase "max cache" when the server can handle it until a full 3 days max cache is possible. This method allows the greatest opportunity for the most clients to get work. Even if it's just 1 task for the first 5 minutes, at least the client is crunching. Past Challenges have shown that clients have a good chance to reach "max cache" before their first task is complete. We expect the same this time. -At worse, you'll only be 1 WU late on each core starting the Challenge. -At Challenge Start, update computers to "Allow New Tasks"
NOTE: This presumes you have all other BOINC projects suspended. Please once again review the "Welcome" post as well as the "How to Join" post so you can be informed and make any last minute adjustments that are necessary. Before the start, the Subproject stats on the Server Status page will be disabled as will the 24 hour stats on the bottom of the front page. Also, the Top Primes Finder page will be disabled. This is all done to free up as much resources to allow the server to send and receive work. The server always gets hit hard at the beginning of the Challenge. However, a procedure that we've been using for all the Challenges this year has been very successful so far, and we hope it holds true for the final Challenge. A few hours before the start (14 February 18:00 UTC) "max cache" will be dropped to 16 tasks per core. Additionally, "max to send" will be dropped to 8 tasks per core. Anyone attempting to request more will be met with "max cache" messages. We'll load at least 10K+ into the buffer. At the start of the Challenge, these settings will be adjusted as necessary. Historically, the first adjustment happens around 30 minutes post start by raising "max cache" to 32. We'll continue to increase "max cache" when the server can handle it until a full 3 days max cache is possible. This method allows the greatest opportunity for the most clients to get work. Even if it's just 1 task for the first 10 minutes, at least the client is crunching. Past Challenges have shown that clients have a good chance to reach "max cache" before their first task is complete. We expect the same this time. Message 20991 - Posted: 14 Feb 2010 | 13:50:23 UTC - in response to Message 20977. We'll continue to increase "max cache" when the server can handle it until a full 3 days max cache is possible. PPS LLR WUs are now coming with 26 hour deadlines. I don't think it will be possible to load up a 3 day cache since the BOINC client would go into EDF and stop requesting new tasks. All my clients are up since i am in the Tour de Primes. I have lowered my cache to 0 and am hoping everything will be fine since i am not at home from 1700 UTC to 2100 UTC. Hopefully i am not hit by a "deferred for x hours". Message 20997 - Posted: 14 Feb 2010 | 16:40:24 UTC - in response to Message 20991.
has anybody the same problem? Message 21000 - Posted: 14 Feb 2010 | 19:08:39 UTC - in response to Message 20999. Im not able to get any more tasks. My client reports: "Message from server: Server can't open database". What do I do? Message 21001 - Posted: 14 Feb 2010 | 19:08:59 UTC - in response to Message 20999. I have the same configuration: w7 (ultimate), 64bit, i920@3GHz, Boinc 6.10.21, running 7 tasks (plus 2 collatz). but no problems. Seems this is a specific error on your machine. How do you run BOINC? As admin/system user, as your user, accessible for all users, protected mode, etc? 14-Feb-2010 19:59:47 [PrimeGrid] Sending scheduler request: To fetch work. Server is now reporting down for maintenance .... we broke it. Message 21004 - Posted: 14 Feb 2010 | 19:38:15 UTC - in response to Message 21001. I started a virtual machine, seems to be okay. I can´t find the mistake on the main machine. Thanks. Message 21005 - Posted: 14 Feb 2010 | 19:51:16 UTC - in response to Message 21003. That's way too slow for a PPS LLR. My Q6600 (Core2Quad @2.4GHz) cranks out 4 every 12 minutes. The i7's are a lot faster and ~5 min seems about right for a fast i7 with HT turned off. Message 21006 - Posted: 14 Feb 2010 | 19:54:57 UTC - in response to Message 21005. I get around 16-18 minutes per WU per thread (8 threads) on my i7 920 too. I have HT on because the performance win is too much to pass up by turning it off. Message 21008 - Posted: 14 Feb 2010 | 19:59:31 UTC - in response to Message 21004. The error's that I have been able to see (with server load isues right now, only a couple) would be consistent with GPU driver problems on your ATI 58xx series--will not affect a VM as you have discovered. When the challenge is done, you should check your drivers for problems. The 5 min times are for PPSE units. Right now the server is only issuing longer PPS units, which will be a good bit longer to run. Message 21010 - Posted: 14 Feb 2010 | 20:05:23 UTC - in response to Message 21003. Message 21011 - Posted: 14 Feb 2010 | 20:19:21 UTC - in response to Message 21007. For LLR tasks, it may not be worth it. For reasons not entirely understood, running multiple LLRs on the same CPU causes them all to slow down. Combined with the penalty inherent in running HT, at least one person has reported that his run times with 8 LLRs on an i7 were just under double what he was seeing running just 4 LLRs. At least on that i7, he could do 8 LLRs almost as fast with HT off as with HT on. I guess it really comes down to this: ARE you seeing a performance win with HT on when you're running all LLRs? If you're not running all LLRs you'll see a larger gain from turning HT on. I'm seeing 12 minutes on the PPS WUs from today's challenge. That's on a 2.4GHz C2Q, so I'm also getting hit bad with the multiple-LLR slowdown as well as running the older Core2 architecture. Also, this is my main computer, not a dedicated cruncher, and I typically see a 20% difference between CPU time and real time due to all the stuff running on this machine. There's no way an i7 should be running 50% slower than my computer is. unless you UNDERclocked it to about 1 GHz. Edit: Oops, I forgot Geeknik's i7 is running 8 tasks. See my post below. Message 21012 - Posted: 14 Feb 2010 | 20:22:55 UTC - in response to Message 21010. My Core2 Duo, T6500 (2.1GHz) crunches PPS LLR WU in ~12 mins. I think not bad for this machine. For yahoos, I temporarily dropped boinc manager to run only 6. It ran several in 10.5 minutes.. Yes, less time, but still not enough to cover the loss of the extra 2 virtual cores. Also, not willing to experimanet much more atm.. I can see running with 7 if running GPU, as GPU based tasks will not need to wait for CPu bandwidth as much..
For me, HT stays on, as well as 100% cpu. Message 21014 - Posted: 14 Feb 2010 | 20:41:58 UTC - in response to Message 21011. ...so the i7 clearly has better performance than the C2Q even with HT turned on (my i7 is also my main home-office PC which runs a GPU project in addition to the normal home-office workload). Message 21015 - Posted: 14 Feb 2010 | 20:44:38 UTC - in response to Message 21011. I was forgetting that the i7 was running 8 tasks while I'm running only 4. So 18 minutes for a task is at 75% of the time it takes my computer. Still, that seems pretty slow compared to my machine, which was hardly state of the art when I bought it, let alone now. Plus, my 2.4 GHz C2Q is doing them in 12 minutes and Geeknik's 2.66 GHz C2Q is doing them in 19 minutes? Something is very, very wrong there. Message 21016 - Posted: 14 Feb 2010 | 20:52:58 UTC - in response to Message 21014. Yeah, I made a mistake, but I still think there's something wrong. I'm also running GPU tasks, Vista's Aero, watching videos, etc. My computer is far from optimized for crunching. The I7 isn't just higher clock speeds and HT; it's a better architecture, memory interface, and so forth and he should be crushing me. Plus, his Q9450 -- which is the same as my CPU except with a 10% faster clock and a bigger L2 cache than mine -- is taking 50% more time to run than my computer is. Something is very much not right. I am at 22-23 minutes with my Xeon W3520 (2.66 GHz w/HT). And 23-25 minutes with my Xeon E5504 (2.00 GHz w/HT). The Q9550 (2.83 GHz) has 9.5 to 10 minutes. The Xeon E5405 (2.0 GHz) comes in around 12.5 to 13.25 minutes. Message 21019 - Posted: 14 Feb 2010 | 20:59:39 UTC - in response to Message 21016. Yeah, I am a bit surprised, too. Mine is at 18min and is just a stock Dell XPS system, but I was hoping for a bit more with the QPI and better HT implementation (at least compared to the old HT from the P4's). Still, with the really small size of the PPS work units, the extra kick from the better bus, etc. may not be relevant like it appears to be on the bigger LLR's. Agreed...My first suspicion would be that EST or some other power saving option is accidentally turned on on his box...or maybe thermal throttling with overheating issues??? So since this challenge is using prime scoring, is there a place to see how things are going scoring wise? I assume the team/individual links are tracking cobblestones. Arg, the fu**ing flash-plugin in firefox was eating up one Thread on the W3520, had to pkill firefox since it was not responding anymore. Should be faster now there. EDIT: Okay, the E5504 is an engineering sample and only supports C1 as it seems, but why are there several states in use on the W3520? Message 21024 - Posted: 14 Feb 2010 | 21:43:30 UTC - in response to Message 21020. Hmmm, I assumed those were the scores, not the cobblestones. Okay the W3520 is down to constant 17.5 minutes/WU now. That sounds better. Message 21027 - Posted: 14 Feb 2010 | 21:52:33 UTC - in response to Message 21020. I calculated, by a specific workunit taking x amount of time, 8 i7 cores still beat 6 i7 cores, on WUs per hour, even though they take less time.. In the simap races, there are several i7-920 that still beat this 965.
looking at the boink benchmarks, the floating point is higher than mine, though my integers is higher..
Then you look at the E5k series.. Message 21030 - Posted: 14 Feb 2010 | 22:24:48 UTC - in response to Message 21003. Nearly all my comps are 64 bit vista or xp (the two remaining single cores are 32 bit) and the AMD 965 Deneb is doing them in 8 min; the AMD Phenom 9950's (two of them) are doing them in 10 minutes and change. only a minimal OC is in effect as I don't have time to babysit them. Message 21033 - Posted: 14 Feb 2010 | 23:17:52 UTC - in response to Message 21027. Message 21041 - Posted: 15 Feb 2010 | 9:04:49 UTC - in response to Message 21032. Damn, my isp has problems: no internet-connection until 2000 UTC. Message 21048 - Posted: 15 Feb 2010 | 14:01:53 UTC - in response to Message 21044. I don't know what's wrong as there is no stderr output shown, but it's certainly got a problem running these. Do you have anti-virus that's not happy with the executables? Do you have a full or write-protected disk? I can't think of anything else to check off the top of my head. Message 21049 - Posted: 15 Feb 2010 | 14:23:46 UTC - in response to Message 21044. There is this thread that is related to your problem. Maybe you should try those tips. How many Challenge score points do I get per reported PPS LLR WU? What happens with the accumulated score after the end of the Challenge? I have all the libraries listed in that thread. Message 21059 - Posted: 15 Feb 2010 | 19:49:31 UTC - in response to Message 21056. Message 21060 - Posted: 15 Feb 2010 | 20:24:42 UTC - in response to Message 21056. To find more info about "prime score", see this post. The accumulated score will be used to determine rankings. As grueny points out, those rankings will earn Challenge Points for the overall Challenge Series. Message 21062 - Posted: 15 Feb 2010 | 20:48:38 UTC - in response to Message 21061.
you had to complete those two WU's in three minutes and didn't, they timed out and were re-issued.. not a problem with you. Message 21068 - Posted: 16 Feb 2010 | 1:02:17 UTC - in response to Message 21067. Sorry, PRPNet is not included in the Challenge. However, you will receive your "normal" PSA credit for the work. Also, any primes found will be included in the Tour de Primes. Prime counts and scores will be kept for all Top 5000 primes discovered in the month of February. To participate in BOINC PPS/PPSE LLR, all you have to do is select it in your PrimeGrid preferences. To participate in PRPNet PPSE, please see this post. Manual cobblestones are earned. However, it may take up to a month before they are applied. Message 21070 - Posted: 16 Feb 2010 | 2:46:46 UTC - in response to Message 21068. Some of my slower Laptops are getting more WU's then they can do before the deadline. Is there a way to adjust this? This morning 1 of them d/l 15 WU's that were due at 7:23AM and they were d/l @ 4AM and it takes about 50 mins per WU. There was no way for it to do that many WU in that short of time. Also what is the OLDEST BOINC that you folks recommend??? Message 21083 - Posted: 16 Feb 2010 | 14:24:37 UTC - in response to Message 21073. I also wonder what causes the 1 hour delay in Challenge statistics! Yesterday updates were issued every 15 min. Message 21085 - Posted: 16 Feb 2010 | 14:25:53 UTC - in response to Message 21078. Message 21086 - Posted: 16 Feb 2010 | 14:40:10 UTC - in response to Message 21085. I have them set to connect every 1 day and the additional work is set to 0. Sat 13 Feb 2010 01:46:43 PM EST	PrimeGrid	Message from server: PPS LLR is not available for your type of computer. Sat 13 Feb 2010 01:46:43 PM EST	PrimeGrid	Message from server: No work available for the applications you have selected. Please check your settings on the web site. Message 21088 - Posted: 16 Feb 2010 | 14:52:46 UTC - in response to Message 21086. With your settings you would require enough work for at least one day to cover the uptime until next connection. Message 21089 - Posted: 16 Feb 2010 | 15:03:02 UTC - in response to Message 21087.
i'm getting this message using a 64-bit linux. to run 32-bit applications you have to install some libs. Message 21090 - Posted: 16 Feb 2010 | 15:03:09 UTC - in response to Message 21087. Message 21092 - Posted: 16 Feb 2010 | 15:48:00 UTC - in response to Message 21091. Message 21093 - Posted: 16 Feb 2010 | 15:48:08 UTC - in response to Message 21091. Message 21094 - Posted: 16 Feb 2010 | 15:48:15 UTC - in response to Message 21091. Completed result pps_llr_24233475 refused: result already reported as sucsess"
I have been getting the same error, "Server can't open database" for 1-2 hours. When I finally connected I received the message above. What does it mean and did I lose the credit for the jobs? May your addiction to Boinc be greater than mine! I received about 75 of the messages "refused: result already reported as sucsess"
Message 21097 - Posted: 16 Feb 2010 | 16:51:01 UTC - in response to Message 21096. THAT's no problem - they were reported, but your client did not get the message in the first time. Message 21098 - Posted: 16 Feb 2010 | 16:53:41 UTC - in response to Message 21096. This happens if the server has already accepted the results, but the client does not wait up to the confirmation. Not further from meaning. you either speed up that database by a magnitude or stop running challenges with such short WU's! Message 21100 - Posted: 16 Feb 2010 | 16:53:54 UTC - in response to Message 21095. No credit lost...your result was reported, but the contact back to the client was interrupted resulting in the client thinking it still needed to report the work. When it was able to reconnect and tried reporting, the server responds with this message telling since the result was already reported successfully. Message 21101 - Posted: 16 Feb 2010 | 16:58:16 UTC - in response to Message 21099. Thanks guys, what a relief. I am still in the race and hoping to place within the top 100. Maybe .. Maybe not? Message 21103 - Posted: 16 Feb 2010 | 17:03:01 UTC - in response to Message 21102. As y'all are fully aware, we are limping along with sporadic server overload. While it is unfortunate, it's not devastating. Most hosts are connecting within a few attempts. However, as a precautionary note, we encourage users to increase their cache to at least 4-5 hours so queues don't run dry. This hurts "prime finder" status, but it keeps cores running. Stats now have to be run manually. There's life in the validator but it's having trouble catching up. PRPNet has been shut down and will remain down for the duration of the Challenge. I know this puts a damper on the Tour de Primes effort but we're in survival mode now. Everything was going well for the first 36 hours then Challenge stats runs started overwhelming the server. Once that happened, it started a snowball effect on other processes. We are working to clean things up and decrease server load so more connections are freed up. Message 21110 - Posted: 16 Feb 2010 | 17:46:06 UTC - in response to Message 21106. BTW, these 26 hour deadline are wrecking havoc on my computers. I *think* the problem is with 6.10.18, but that's just a guess. Note that on all computers, I have only PrimeGrid running on the CPU, and only PPS-LLR tasks running. Nothing else. Beginning as soon as I started receiving the 26 hour deadline tasks a few hours before the challenge started, BOINC decided it had to run these in High Priority mode. I'm guessing this is because it may think it can get then returned before 24 hours of the deadline -- a mere 2 hours after the WUs were sent. Note that at this time the machines had queues of 0/0.04, or just under one hour. Oddly enough, even though running in high priority (EDF) mode, BOINC was still fetching more work. Never saw it do that before. Because it was still fetching work, and there were no other projects to preempt, the EDF mode had no effect on the computers. Refuse to get new work as long as anything is running in high priority mode... which means it won't get new work until all four cores are empty. Then attempt to get a day's worth of work. If I hit a DB error, back off (and sit idle) for 1 hour before trying again. If I'm lucky enough to get a successful call to the server, I get about 2 hours of work. Then nothing gets downloaded again until the machine runs dry again. So if I'm not babysitting the machine when it runs dry, it's going to sit idle for a long time. Best case scenario: 1 to 3 cores sit idle until the last core finishes; worst case scenario: the machine sits idle for hours and hours until it wins the lottery and gets some more work. The two old single core machines are still downloading work despite being in EDF. They do about 2 WUs per hour, each. The quad does about 20 per hour. Unless it has no work, of course. The short deadline is really hurting now. "As y'all are fully aware, we are limping along with sporadic server overload. While it is unfortunate, it's not devastating. Most hosts are connecting within a few attempts. However, as a precautionary note, we encourage users to increase their cache to at least 4-5 hours so queues don't run dry. This hurts "prime finder" status, but it keeps cores running." I had to reduce the number of WU in order to complete them in time because of the short deadline. If I increase the number of WU's download then I am back with the same problem! Not to press the issue, but how often can we hope to see challenge stats updates? Thank you for the feedback on the short deadlines. It's obvious that's causing some unique problems as well. The only good news about that is we're less than 26 hours from the finish so hopefully the problem becomes less the close we get to the finish. You probably won't see any real improvements until about 12 hours left...and that's only if you have at least 12 hours cache. As for stats, we are presently working on them. We'll get them out as soon as possible. Message 21115 - Posted: 16 Feb 2010 | 18:16:18 UTC - in response to Message 21114. Thank you for the feedback on the short deadlines. It's obvious that's causing some unique problems as well..
you did not know about that? 48 hours most likely would have been fine, but all those hosts running them newer clients are on immediate report now. It would have been better if you had started out with the deadline set to Feb 17 1900 hours. That way You would not had to worry about making any deadline but the last one. Plus people like me would not had to abort WU's because too many were d/l to begin with! As it is I have to set my PC's so they only get enough work to run about 4 hours! Stats have been updated and will hopefully update every 1/2 hour now. WU deadlines have been extended to 48 hours but the current buffer must empty first to get to them. It's probably too little too late. Damn i got one prime every other day in the "Tour de Primes" but in this challenge and i have more clients now. I am a little unlucky at the challenges. Message 21121 - Posted: 16 Feb 2010 | 21:04:03 UTC - in response to Message 21102. Same here...had just crept into the top 100, then lost ground due to a low cache setting (grr!). At 108 now and hoping to place. On another note, my WUs are getting noticeably longer. We must really be cranking through n values! Message 21122 - Posted: 16 Feb 2010 | 22:05:36 UTC - in response to Message 21121. Yes, we've gone from n~710K to n~767K. Simply AMAZING!!! Message 21124 - Posted: 17 Feb 2010 | 0:11:54 UTC - in response to Message 21122. Whoa, that must be like a month's worth of normal work! Well Its not looking good for me to place in the top 100 this challenge. I do think lowering the challenge to 50 teams and 100 participants has helped competition. I will however fight to the end trying!! Message 21127 - Posted: 17 Feb 2010 | 2:57:55 UTC - in response to Message 21126. Wow, There are 4 crunchers with out a team, If they formed there own team they would be in team points but not Individual points. But DaveSun (ranked 101) is just out of the Individual point (as of now) Real close to having point in both if only he formed his own team, [of one]. I'm shutting down 5 hosts (well, one will be on if I'm home), so that should help lighten up the load. Still have the 4 fastest quads running though. At least your nodes are not hidden. I hate the guys that participate with hidden hosts, you do not know what they have, it is as if they would start in a real sports competition under a cloak and would not let the competitors sneak a peek on their physical appearance. Now is the time to start preparing for the end of the Challenge. We are lowering max cache as well as the buffer to help minimize abandoned WU's at the end. For those "moving on" after the Challenge AND have a full cache of work now (12 hours worth), it might be a good time to set "no new work". Make sure to update your clients early and often to get those completed WU's reported and counted. A quorum of 2 is NOT needed to award Challenge score - i.e. no double checker. Each returned result will earn a Challenge score. Please note that if the result is eventually declared invalid, the score will be removed. Therefore, the Challenge will not be considered final until all quorum's affecting scoring positions are completed. Because of this, we have a "clean up" period where the goal is to complete these quorums. We hope for a fast "clean-up". If everyone can remember to either complete their cache or ABORT their WU's, then we'll be able to finalize earlier rather than later. If you have the resources, please consider helping in the "clean-up" process after the end. However, we fully understand the need/desire to "move on." Message 21131 - Posted: 17 Feb 2010 | 7:27:11 UTC - in response to Message 21129. I look at it more like doing the cannonball run... I show up in a jalopy but I am not gonna let you look under the hood at my dual turbo V12 and oh yea I got a NOS just in case I need a boost. Message 21134 - Posted: 17 Feb 2010 | 9:14:31 UTC - in response to Message 21129. Message 21137 - Posted: 17 Feb 2010 | 10:57:21 UTC - in response to Message 21127. Hadn't thought about forming my "own team of one" - but have done so now. Too late for this challenge though! ;-) I`m just in to say Hei! Message 21139 - Posted: 17 Feb 2010 | 12:40:11 UTC - in response to Message 21134. [quote]At least your nodes are not hidden. Message 21140 - Posted: 17 Feb 2010 | 14:05:36 UTC - in response to Message 21130. Next, I'll derive the evidence for Global warming as I shovel the snow from my South Carolina decking. Yes, this really was on my SC deck railing a couple days ago. Final preparations are in full force now. We continue to lower max cache as well as the buffer to help minimize abandoned WU's at the end. For those "moving on" after the Challenge AND have a full cache of work now (3 hours worth), it might be a good time to set "no new work". The incidence of server overload is increasing. Please update your clients early and often to get those completed WU's reported and counted. Don't wait till the end with a large cache of results to submit. We hope for a fast "clean-up". If everyone can remember to either complete their cache or ABORT their WU's, then we'll be able to finalize earlier rather than later. Expect up to a week or more before results become final. Message 21144 - Posted: 17 Feb 2010 | 15:25:44 UTC - in response to Message 21140. Are that inches or centimetres? I'm nowhere close to making the top 100 individuals (I'm at about 275 right now), but if I made my own "team-of-one", I would almost make the top 50 teams all by myself. I'd rank 54 on the teams list. Message 21146 - Posted: 17 Feb 2010 | 15:34:26 UTC - in response to Message 21144. Inches and the end is on top of the rail, not beneath it. Also, it was after 9 am so it had already melted a bit. It's all gone now. Message 21147 - Posted: 17 Feb 2010 | 16:15:01 UTC - in response to Message 21146. 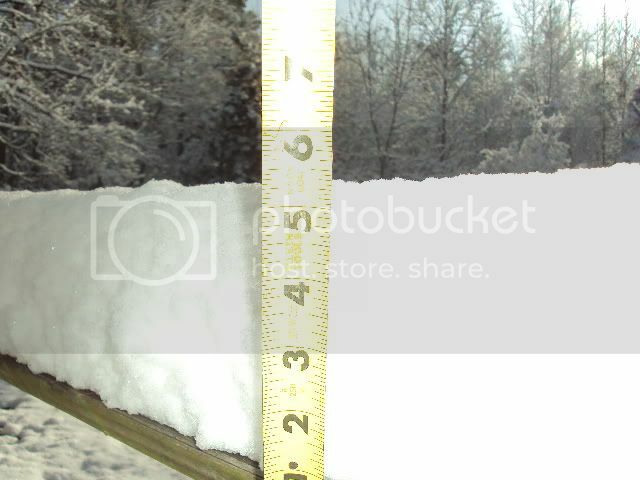 We have over 20 in. in N.E. Ohio and it's not melting anytime soon. Snowing now too !! The low temps keep my basement cool and two of my P.C.s . Individuals should only form teams if they want others to join and compete as a team. A small team, say "old computers unite" should be able to compete in the teams even if together they would only place 300th in the individual scores. I have seen a number of individuals competing for the 100th individual position this year and the competition seems to be harder to place in than last year. Last year I could have placed in 80's but did not try because I could not get any challenge score in the individual. This year they lowered it to 100. Still a little too high for me but I tried. If someone wants to be a team of one maybe he will acquire some members and be a real team. Let individuals compete as individuals and teams as teams! Message 21149 - Posted: 17 Feb 2010 | 17:08:09 UTC - in response to Message 21148. For this challenge, I'm the only one from my team participating, though it isn't always that way. Message 21150 - Posted: 17 Feb 2010 | 17:17:26 UTC - in response to Message 21148. Individuals should only form teams if they want others to join and compete as a team. I wasn't suggesting otherwise. Just pointing out that the competition to get on the board as an individual is much more intense than it is for teams. Most of the individuals (at least as measured by points) are concentrated in several large teams, and the size of the teams drops off very rapidly. Also interesting is that the #1 individual would rank #8 on the teams list. Also interesting is that 1, 2, and 5 on the individual list comprise about 40% of the #1 team -- which has nearly double the points of the #2 team. The Year of the Tiger Challenge has completed. The battle for primes is over. As soon as the dust settles, we'll be back with preliminary results. Well done everyone. Once again, an incredible amount of work has been completed. So how far behind are the prime notifications? I have 10 hits but I don't know if I am the primary or the secondary yet and I have only had one 2 emails so far. Message 21154 - Posted: 17 Feb 2010 | 18:21:27 UTC - in response to Message 21153. Primes are lagging several hours behind. They all have to be tested for (x)gfn divisibility and that's the hold up. We are adding more resources to that now. While the Challenge is officially over, the "clean up" process now begins. If you have the resources, please consider helping. All that is required is to continue crunching PPS LLR to complete the aborted and timed-out resends. However, we fully understand the need/desire to "move on." Over 2M tasks (1M WU's) were completed resulting in over 23M cobblestones awarded...an astounding amount of work done for an LLR Challenge. Over 90 "Top 5000" primes were found. I'm sure there's more to come once the validator catches up. 254 teams and 1849 individuals participated in the Challenge. Thank you to everyone. We appreciate your participation and hope you had fun! What a GREAT start to the 2010 Challenge Series. I think it is safe to predict the top 5 in each category. Note: scores are not final as tasks later determined to be invalid will be deducted from the total score. Thanks for the challenge ... I enjoyed the way this worked! I keep on crunching for the "Tour de Primes". That should help a bit while cleaning up. Message 21164 - Posted: 17 Feb 2010 | 21:28:57 UTC - in response to Message 21161. We did much more than i had expected. Message 21166 - Posted: 17 Feb 2010 | 22:11:24 UTC - in response to Message 21164. Keeping mine full tilt to help with the clean-up, also. Will you also post the number of tests completed and how much the leading edge was advanced? Switching back to PPS to help the cleanup. Message 21174 - Posted: 18 Feb 2010 | 1:34:49 UTC - in response to Message 21166. Keeping mine going too, but not full tilt; it seems that overclock caused one invalid WU. (Either that or a cosmic ray made it fail.) At least it wasn't an SoB WU or something! For some stupid reason, one of my computer was set to run boinc only on idle, and although I didn't use the computer at all over the challenge, there was not a single WU computed. Even with this computer running, there is no chance for me to reach the top100. Message 21186 - Posted: 18 Feb 2010 | 14:20:30 UTC - in response to Message 21174. It is not always an overclock that causes an invalid...I had some on my box stock purchased computers (Dell i7, Toshiba laptop). Please help us report all the primes found during the Challenge. Check out the unclaimed primes thread. Currently 18,880 tasks are outstanding from the Challenge. Of those, 4374 are in scoring positions...affecting the outcome in 8 team positions and 34 individual positions. We expect these numbers to drop substantially by tomorrow. Thanks to everyone for helping out with the clean up. Is this option not working ? Message 21203 - Posted: 18 Feb 2010 | 23:56:04 UTC - in response to Message 21202.
sumbangpc: Is that option set for all your profiles? Message 21207 - Posted: 19 Feb 2010 | 6:36:26 UTC - in response to Message 21203. Yes, but seems that they need my real name. The count of primes found on my account page ticked up by one during the challenge, but I never received any notification of any sort. Does that means I was the double checker, or is there still a backlog of processing all the primes that were found? Is there an ETA on getting the user lists of primes back online? It still says it's offline for the challenge. Message 21216 - Posted: 19 Feb 2010 | 16:02:54 UTC - in response to Message 21214. See this post. Since your name is not listed, you must have been the double checker...or you found a prime that was already reported. As soon as Challenge stats are final, purge will begin. Once the DB gets down to a reasonable size (1-2 days later), all links will be restored. Currently 4393 tasks are outstanding from the Challenge. Of those, 376 are in scoring positions...affecting the outcome in 1 team position and 10 individual positions. As you can see, excellent progress was made. We'll take another look within a couple hours after 18:00 UTC today (48 hours after end of Challenge). We expect results to be final then. Thanks to everyone for helping out with the clean up. Currently 934 tasks are outstanding from the Challenge. Of those, 69 are in scoring positions...affecting the outcome in 1 team position and 3 individual positions. Clearly the ~90 that needed to get done, didn't. Of the 69 in scoring positions, really only 13 tasks need to complete to solidify standings. Challenge stats remain disabled and will be for the duration of the clean up. We disabled stats which immediately improved the connection status to the server. They will remain off till the completion of the Challenge. Of the 182 tasks outstanding in scoring positions, only about 1/2 are needed to finalize the Challenge. Message 21268 - Posted: 21 Feb 2010 | 5:54:06 UTC - in response to Message 21216. Message 21269 - Posted: 21 Feb 2010 | 5:59:24 UTC - in response to Message 21268. It probably was (past tense) on the front page (bottom left). I found my one and only a few weeks ago. I saw my name there. It kept on going down the list until it was gone. It only took a few days and my name was gone. Currently, the list has 18 names or primes found. I theorize that the quantity of newly found primes was so great during the challenge that your name might have only been there a few minutes. It might be that they aren't updated very frequently and it was off the page before it even got posted. It was a special event for me, but the limelight didn't last long. Cupid and the Tiger were quite busy snagging all those primes. In the 72 hours of the Challenge, 110 "new" Top 5000 primes were discovered with over half of those making it into the Top 1000. Never before has the Prime Pages seen such an onslaught of high ranking primes, especially Top 1000. Over 2M tasks (1M WU's) were completed resulting in over 23M cobblestones awarded...an astounding amount of work done for an LLR Challenge. While the prime feast was quite fulfilling, the actual entirety of the Challenge had its problems. The connection issues starting at hour 36 and ending at hour 48 were directly related to the Challenge stats script. These connection issues had adverse effects on hosts which were competing with less than 2-3 hour cache. The dreaded "backing off for 1 hour" message hurt those hosts which had less than an hour's cache. Reworking how the script ran helped resolve this issue. Additionally, PRPNet was shut down to open more connections for the Challenge. NOTE: PrimeGrid BOINC has priority over PrimeGrid PRPNet when limited resources are available. Additional connection issues came after the conclusion of the Challenge; therefore, they had no impact on work done during the Challenge. These were directly related to the size of the database. Even with the reworked Challenge stats script, it was taking up too many resources. Once the Challenge stats were shut down completely, the connection issues minimized. Finally, we made a miscalculation in task deadline. This caused "high priority" issues with many hosts and did not allow a full cache to be reached. However, this did not have any significant impact on the connection issues the server experienced. Unfortunately, it did impact the hosts by not requesting more work during the "high priority" period. With the connection issues, these hosts had a harder time keeping work in their cache. The track record for Challenge conditions had really improved from 2008 till now. It had been over a year since we experienced these connection issues during a Challenge (the Oct 2009 Harvest Festival Challenge had DB issues after the Challenge). It seems as though the issues with the current Challenge brought back some old memories. For this, we apologize. The old adages of "Success is short lived" and "you're only as good as your last performance" certainly apply here. We'll do our best to improve next time. Conditions that create these connection issues are short WU's, quorum of 2, and extended Challenge period. This leads to an increased database size which cripples the Challenge stats generation. Looking forward, we can foresee only two Challenges that may have similar issues: Full Moon, 25 July, PPSE LLR and Leonids, 17 November, SGS LLR. Fortunately, both of these are only 24 hours which minimizes the chances of problems occurring. We plan to have other measures in place for stats before these Challenges. We hope these problems do not eclipse the incredible amount of work that was accomplished and the never before seen rate in which high ranking primes were being found. Nor should they overshadow the amazing team and individual performances turned in. 254 teams and 1849 individuals (1839 returning valid results) participated in the Challenge. Congratulations to SETI.USA as the top team and Mr. Hankey as the top individual. Remember, the top 100 individual and top 50 team places earn points for this Challenge. Thank you again to everyone who hung in there and kept a positive outlook. We appreciate your participation and hope you had fun! We look forward to seeing you at the next Challenge - The Ides Of March Challenge - 15 March - 24 hours on the PSP/SoB Sieve application! Are there no more e-mails for found prime numbers? Message 21323 - Posted: 23 Feb 2010 | 13:58:31 UTC - in response to Message 21320. Message 21326 - Posted: 23 Feb 2010 | 16:51:14 UTC - in response to Message 21287. In my opinion: That's not so! I'm not running the most up to date boinc client version, but I've nowhere read that this is changed lately. Even running in high priority the Boinc client will request new work, if the cache is not filled up to the limit. The only influence of running high priority is that the client will not switch to other projects. Message 21329 - Posted: 23 Feb 2010 | 18:15:39 UTC - in response to Message 21326.
to the "good old days" of "challenging challenges". so may it rest in peace and let's forgot it as soon as possible. Message 21330 - Posted: 23 Feb 2010 | 18:40:27 UTC - in response to Message 21323.
wolfemancs has found out that my number was already known. Then with it the thing would be clear. A couple of weeks ago we were 3rd. Message 21334 - Posted: 24 Feb 2010 | 1:18:57 UTC - in response to Message 21333. What's a miracle? A few minutes and now I see the score. Great! It was very exciting. My finger still hurts from pressing update. Message 21351 - Posted: 24 Feb 2010 | 15:39:40 UTC - in response to Message 21326.
the problem resulted in every client trying to report every result immediately - that of course generated a lot more traffic than needed. Message 21372 - Posted: 25 Feb 2010 | 17:40:35 UTC - in response to Message 21351. Now the standings are officially assessed, I notice a change in your policy as compared with the 2009 Challenge Serie. Your policy was to skip mini-teams acting as an individual from the individual standings. Now you did not. Is this a change in policy or you just forgot? Message 21374 - Posted: 25 Feb 2010 | 18:23:23 UTC - in response to Message 21372. Oversight on my part. The policy has not changed. Thanks for pointing this out.